Hey Guys, we want to give you an update on what the future of Cemetech looks like. First, we want to say thanks for being amazing. Without all the visitors, the members that have joined, and those that have volunteered to run the community and contests over the last 15 years Cemetech wouldn't be where it is today. We've gone from an InvsionFree board to phpBB community on shared hosting, and eventually moving to a dedicated host. Without you, we wouldn't be where we are right now. In 2018 we attempted to reach a bigger audience on an established and growing social community by opening up a Discord server. It worked and since July our Discord server has grown to 141 members, quickly out growing IRC. The Discord server has channels for 3d printing, various programming languages, gaming, contest discussion plus idea brainstorming, and more; a single channel of Discord & IRC are linked through a bot so that both communities can collaborate. Everyone is welcome to join in so follow this link for the invite. Later in 2018, after recognizing the benefits of opening the Discord, the Cemetech Admins started to explore other ways to tap into established communities. We hemmed and we hawed at ideas. It was thrown out there that we could push Reddit a bit harder but it was not very favorable. We continued to deliberate and could never settle on something. 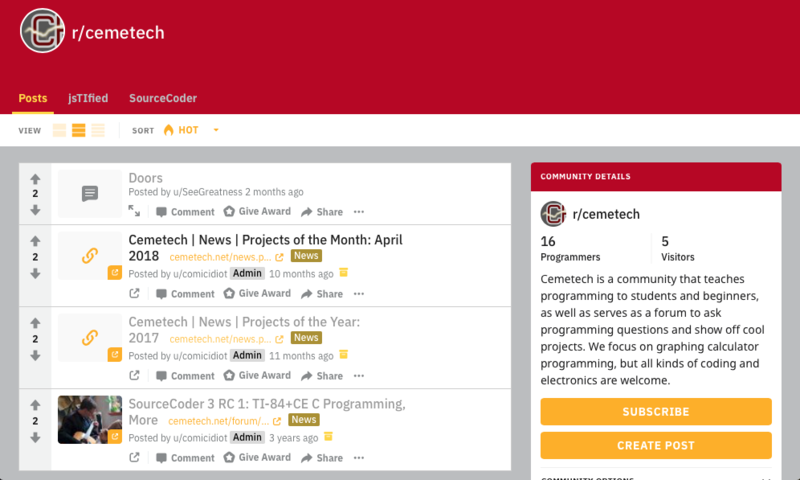 Meanwhile, inspired by the Reddit push idea, Alex had started branding the Cemetech Subreddit with colors and style under the (admittedly unpopular) Reddit Redesign. After finishing the other Admins were convinced it was the right thing to pursue. Now it's 2019 and we're officially announcing that we are going to put the forum in read-only mode on July 1st in favor of our Cemetech Subreddit. It's an extreme move--and not a decision we came to lightly--but with no easy way to bridge the two communities we figured it's best to keep all the discussion on one site. We won't be deleting the forum because we want this wealth of information to be accessible. Even after the forum is put into read-only jsTIfied, SourceCoder, and other Cemetech tools will continue to be available and updated. Your account won't be going anywhere nor will anything else change, you'll still be to create, save, export, and edit projects. We're going to heavily push reddit threads over the next three months so when the forum is placed into read-only mode, the impact won't be as noticeable. To help make the transition easier Cemetech subreddit topics will be automatically posted into the Discord so IRC and SAX members can see when new topics are posted; we're also including a few other calculator and math related subreddits too but in another Discord channel as to not clog up the main discussion. How does this help Cemetech grow? Reddit is home to millions of users and even more visitors. By shifting our community over to Reddit we inherit all those potential members. As mentioned, Discord has been a great inspiration for this. We've had members join the Discord who lurk on the site, but didn't want to create an account. Since they had already signed up for Discord they were able to painlessly join the Cemetech Discord Server and get the help they require by tapping the communities incredible knowledge. Just imagine how many others will join our community now that we have an official presence on one of the largest social forums in the world. If you guys have any questions about this next big step, please let us know and we'll be happy to answer them. © Copyright 2000-2019 Cemetech & Christopher Mitchell :: Page Execution Time: 0.105773 seconds.